Hissing, splashing noises with no open taps: If you hear water is running somewhere, check your house thoroughly inside and out to see if someone left a tap dripping. If all taps are tightly closed, and youre still hear the sound, try to find the exact location of the sound and call a plumber to come to perform a slab leak video inspection. Your floor is warm without a floor heater: this could indicate that a warm water line is leaking beneath your slab - which can mean there is a much bigger problem. A warm spot on the floor usually means that water has started to gather. This water causes moisture, mildew and dangerous mold to form beneath your carpets. 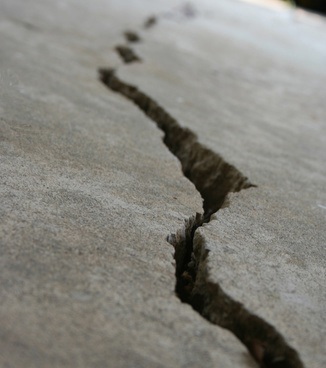 If you notice cracks in your tile floors or bubbles in your linoleum floors: these may indicate a leaking pipe. Ruptures in the walls: a slab leak can trigger the entire wall to move. If the wall moves, your entire house is affected, including walls and floors nowhere near the leak. Swimming pool consistently losing water - there may be a leak. If your water pressure suddenly drops to low, could be an indicator of a slab leak. It is common for slab leaks to occur where the water enters your home from the outside. Even a tiny leak in your water line can significantly lower your water pressure. Sudden increase in water bill - Small holes from slab leaks are capable of leaking more than 10,000 gallons of water in just one month, causing your water bill to rise significantly. .Check to be sure that all of your taps (as well as your washing machine and toilet) are tightly shut off and take a look at your water meter. If the dial is still moving, you most likely have a leak.